As we’ve just gotten in a beautiful new batch of mythic eastern statuary, this seems like an apt moment to review the line-up of Far Eastern iconography. The mighty Buddha is known to take many shapes and forms, sometimes even the absence of form. For those not so well versed in the Buddhist mythology and symbology, it can get a little confusing. 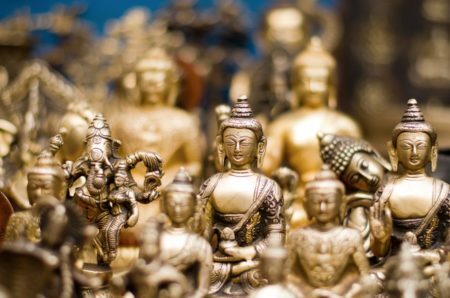 So whether your looking to invoke serenity, attract prosperity, remove obstacles, or perform some other mystical transformation, here’s a quick primer on the many faces of Buddha. The slender, cross-legged figure depicts the young Buddha seated in deep, mindful meditation. Legend says that Siddhartha Gautama lived off just a single grain of rice a day for six years in hopes of discovering the truth. Finally he sat under the Boddhi tree in quiet solitude, and after 49 days achieved Enlightenment. At that time he became known as the Buddha, or “The Awakened One.” He serves as reminder of what can be accomplished through concentrated mindfulness. In order to reach enlightenment, the Buddha first had to discover the Middle Way, the path of moderation between self-indulgence and self-mortification. By following this path, the Buddha was able to transcend duality and all the pairs of opposites, such and good and evil, joy and sorrow, human and divine. With this realization he broke the cycle of suffering, and the fat, laughing Buddha expresses this state of bliss. Arms lifted overhead in a display of joyful victory, Hotei is considered the god of good fortune, the representation of contentment and abundance, and sometimes the guardian of children. Whether seated or standing, his message of prosperity and satisfaction remains the same. You don’t need to spend a dozen years in cave in profound meditation to appreciate the sense of joy and levity conveyed by this version of the Buddha. The eastern goddess or bodhisattva of compassion, female embodiment of Avalokiteshvara, Quan Yin’s worship goes back thousands of years, throughout China, Japan, and southeast Asia. Also known as the goddess of mercy, her name literally means “She who hears the cries of the world.” Westerners might think of here as a loose equivalent to the Virgin Mary, full of grace and mercy. In most imagery, Guan Yin is seen holding a vase or a vessel of some kind. Sometimes she holds her vessel upright, collecting the tears of the world and bearing our sorrows. In other instances she appears to be pouring the tears outward, emptying her vessel, releasing the pain and suffering of the world. The story of this iconic Indian deity goes back many thousands of years and incorporates dozens of myths from the ancient Vedic texts. He is most commonly known as the remover of obstacles, but in his negative aspect he can also be the creator of obstacles. Ganesh is also revered as the lord of success and a guardian of travelers. He is easily recognized with his elephant head and six arms, but has many different incarnations. Most representations of Ganesh include a small mouse at his feet, and often he is even riding on the mouse’s back. 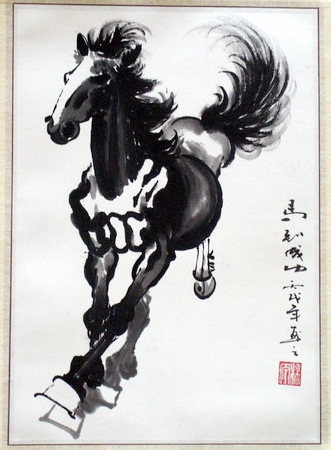 This imagery evokes the unity of opposites and a special balance between the grandest and the most humble of creatures. Other names for Ganesh include Ganesha and Ganapati. Check out the complete article on Lord Ganesh to learn more. Further Reading: If you enjoy these sorts of philosophical excursions and interpretations, you’ll also want to check out the following articles.